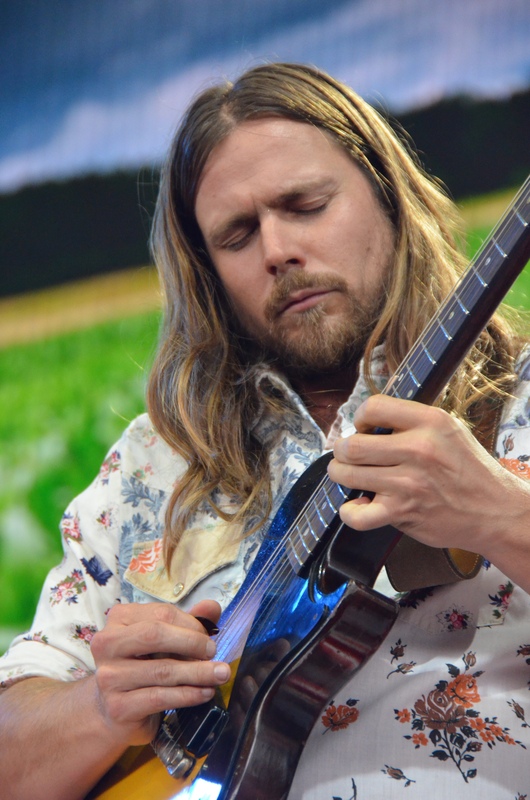 Lukas Nelson is an old soul. Mojo seeps from his veins. Witness this every time he straps on his trusty 1956 Les Paul Junior with his band Promise of the Real (POTR). The tones that emanate from this vintage guitar are otherworldly. Thanks to his famous father—and the company Willie keeps—the 29-year-old musician has seen more of the world than most. On the road now for more than a decade with POTR, he’s already shared the stage with a long list of legends. This does not mean he takes his bloodline for granted. The opposite is true. Lukas is filled with buckets of passion and a desire to learn. He constantly seeks knowledge and guidance from the masters of their craft he is fortunate to call compadres such as: Kris Kristofferson, Neil Young, and Bob Weir. Listen to Lukas sing for the first time and you might hear faint echoes of his dad’s distinctive timbre, but that’s where any comparisons end. Part cosmic country – the love child of Gram Parsons and Janis Joplin – blended with a heavy serving of blues and a pinch of a rock ‘n’ roll je ne sais quoi. Lukas’ journey started in Austin, Texas. Born as the son of Annie D’Angelo (Willie’s fourth and current wife) he grew up mostly in Maui, Hawaii. An “island boy,” Lukas dabbled in everything: from swimming and soccer to skateboarding and surfing. With instruments always lying around the house and spending time on the road with his dad, younger brother Micah, and the rest of the Nelson extended family, it was inevitable music would eventually replace these pastimes. Lukas wrote his first song at 11. After trading in his surfboard for a guitar, he would play 10 hours a day, honing his craft one note at a time. A disciple of the Delta blues, Nelson studied legends like: Robert Johnson, Blind Lemon Jefferson and Howlin’ Wolf. As a teen, Lukas obsessed over their followers: guys like Stevie Ray Vaughan and Jimi Hendrix. Songwriting came naturally. “A great song needs a clever turn-of-phrase and a good melody,” Lukas explains. “With the right rhythms and harmonies you can create something magical that connects with people, but that takes dedication and passion. Ever since forming back in Los Angeles in 2008, the journey for Nelson and his band of musical brothers has been on the up and up. The current POTR six-piece lineup includes: longtime members Tato Melgar (percussion), Anthony LoGerfo (drums) and Corey McCormick (bass, vocals) along with new mates Jesse Siebenberg (steel guitars, Farfisa organ, vocals) and Alberto Bof (piano, Wurlitzer, Hammond B3). Here are just a few of the recent accolades for Nelson: a critically-acclaimed self-titled debut record (Lukas Nelson & The Promise of the Real) released in August, 2017 via Fantasy Records; touring and making records with Neil Young as the 21st century version of Crazy Horse (This is apropos since the band’s name is a reference to the following line from Young’s 1973 song “Walk On”: “sooner or later it all gets real.”). One wonders what Lukas has learned from Old Man Neil? Away from the studio and the stage, Nelson found time to act. He starred in Paradox – a movie that premiered at SXSW this past March that was directed by Neil’s girlfriend Darryl Hannah. A friendship with Lady Gaga (who sang on his debut record) and Actor/Director Bradley Cooper, led to his newest gig: co-writing eight songs with Lady Gaga and acting as a musical consultant for Cooper’s forthcoming flick – a remake of the Hollywood classic A Star is Born, set for a theatrical release October 5. “That was such a cool experience,” says Nelson. This fall sees the band continuing to chalk up the miles; POTR join Lukas’ dad’s family band, along with the likes of Van Morrison, Sturgill Simpson, Brandi Carlile, Nathaniel Raitlieff and the Night Sweats, and Particle Kid (his kid brother Micah’s band) for a string of dates on the Outlaw Music Festival. As our chat comes to a close, Lukas leaves readers with a key piece of Willie’s wisdom that guides his everyday journey.